Things are getting pretty hectic out there in the ol' ILX, I think we all need to calm down and talk about nice things. Let's talk about nice things here. Like, I dunno, dogs? Dogs are pretty good. What about lovely media outlets that write stories about local heroic sporting people who have never been in a sexual or financial scandal? The miraculous return of AA, now that's the good news story we need for ILX. 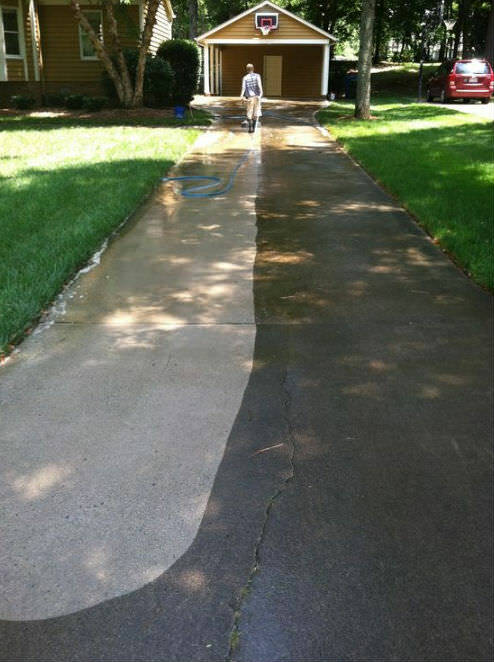 Spent all Christmas break '16 powerwashing the driveway. One of those things you didn't think you needed until you saw what it could do. In the five years we were between dogs, the dog crate sat in the garage and become a home to a few spiders. It's one of those cage-type crates, so when I laid it down in the driveway and powerwashed all the webs and eggs off of it, it created this cool chessboard design on the concrete. Just one of the many ways a power washer (and a dog) can still offer surprises. Eight legs to swim with, imo. SPOILER ALERT RE: POWER WASHERS! A power washer is an electric or gasoline-powered pump attached to a wand with a spray tip, connected to a garden hose for its water supply, capable of spewing out water at high pressure. It can dislodge stuff like dirt or moss from hard surfaces like pavement or the siding of a house by blasting it off. Much like leaf blowers, they can be mesmerizing to use, unless the water is blowing back on you from a wall or eaves and soaking you, then they are unpleasant. Feel free to google it and then post the definition for everyone as a public service. The question is a troubling one. what else could you buy with laptop money?